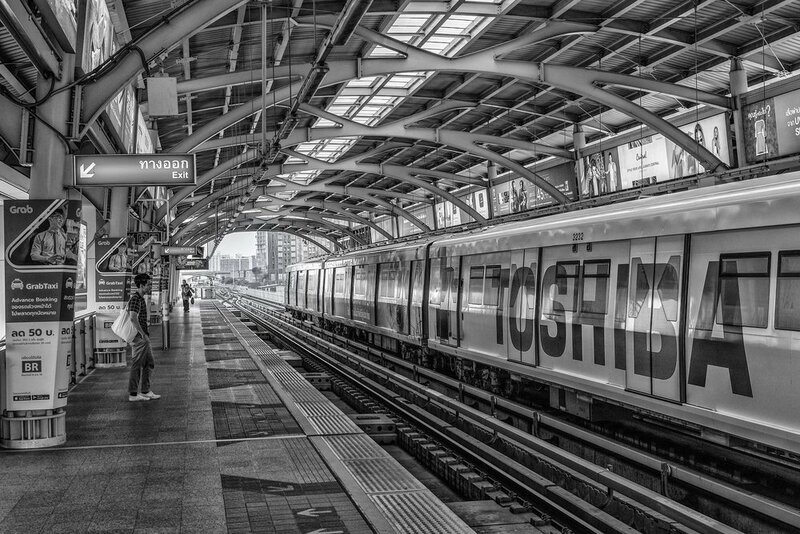 Bangkok's elevated mass transit system, or skytrain is used by tens of thousands of people a day. 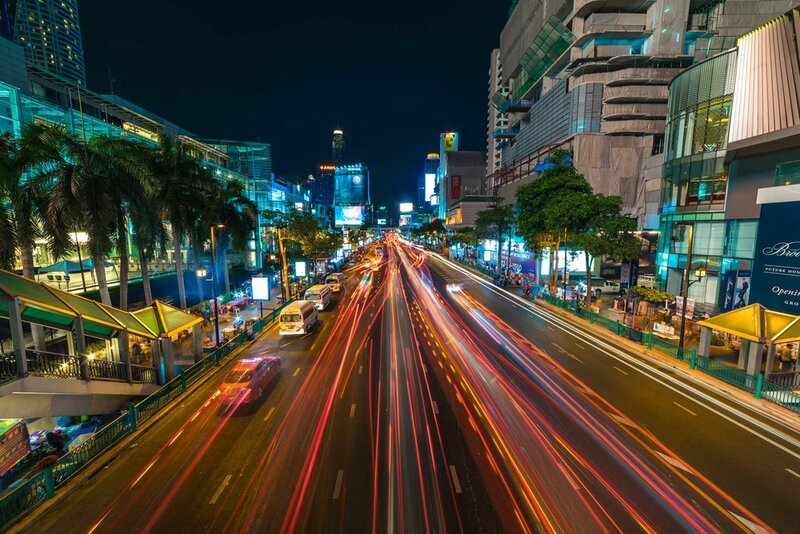 One of the largest intersections in Bangkok, Rajadamnoen serves as a commercial and cultural hub of the city. It has also been the at the center of violent political protests and arson in the recent past. 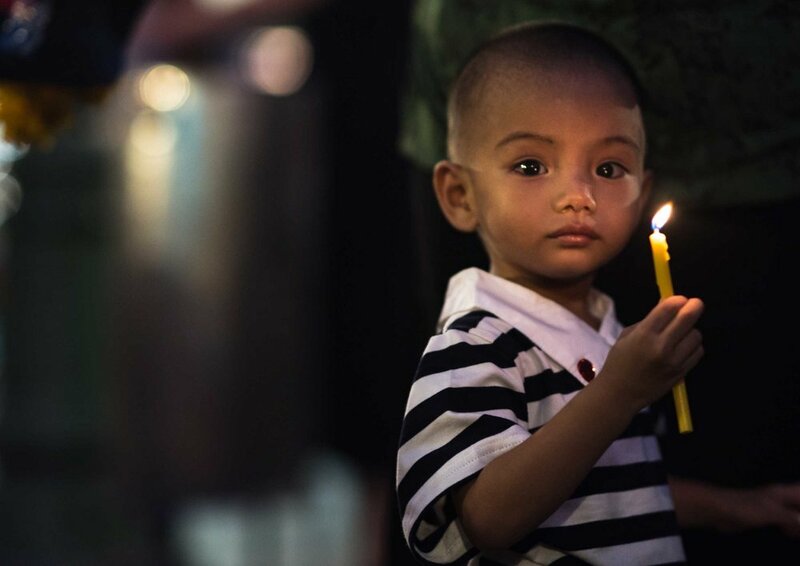 A young child holds a votive candle at Bangkok's Erawan shrine. The shrine, a major religious symbol, and tourist attraction was the target of a terrorist bombing in 2016. 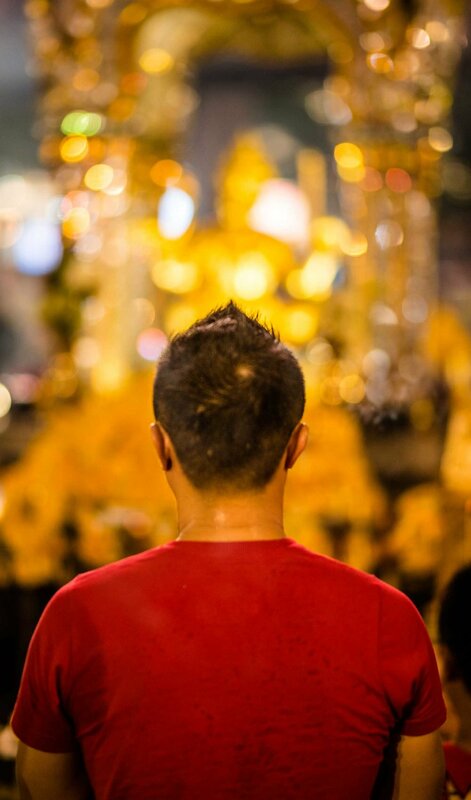 A devotee offers prayers and incense at Erawan shrine in Bangkok. A new skyscraper comes to life in Bangkok. The tower, designed by German architect Ole Scheeren displays a positively unique design. 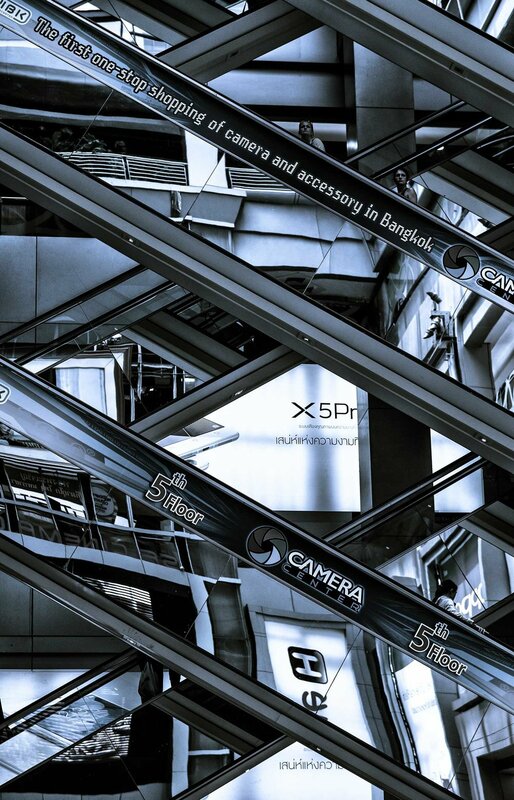 A maze of criss-crossing elevators in Mahboonkrong (MBK) Shopping Center, Bangkok. The tallest skyscraper in Bangkok, Baiyoke Tower looms over the cityscape. 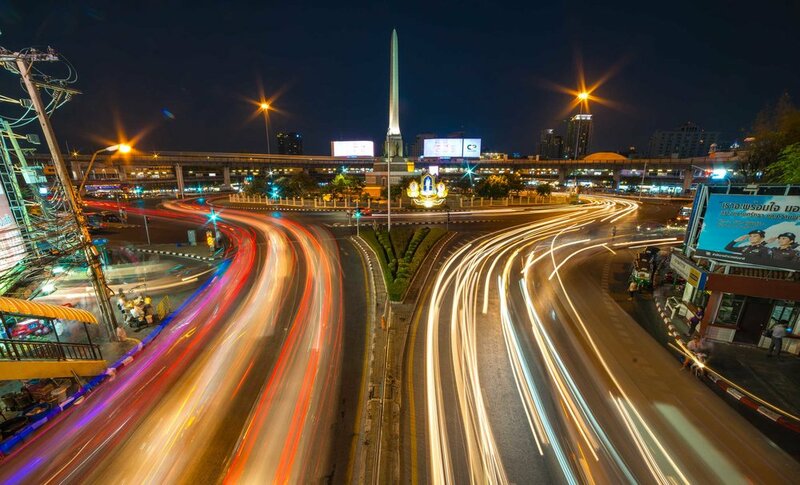 Bangkok's Largest traffic circle, Victory Monument at night. 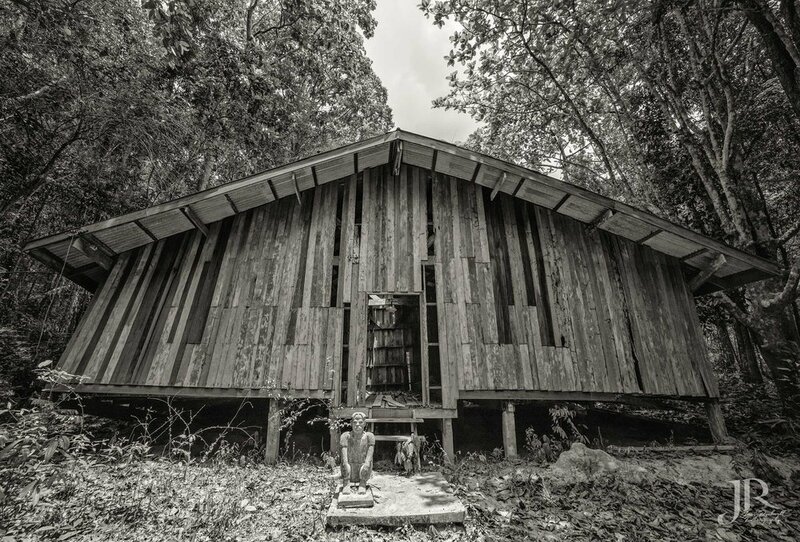 A traditional spirit house sits untended in the forest of Tarutao Island. An aquamarine waterfall rushes through the lush forest of Koh Chang. 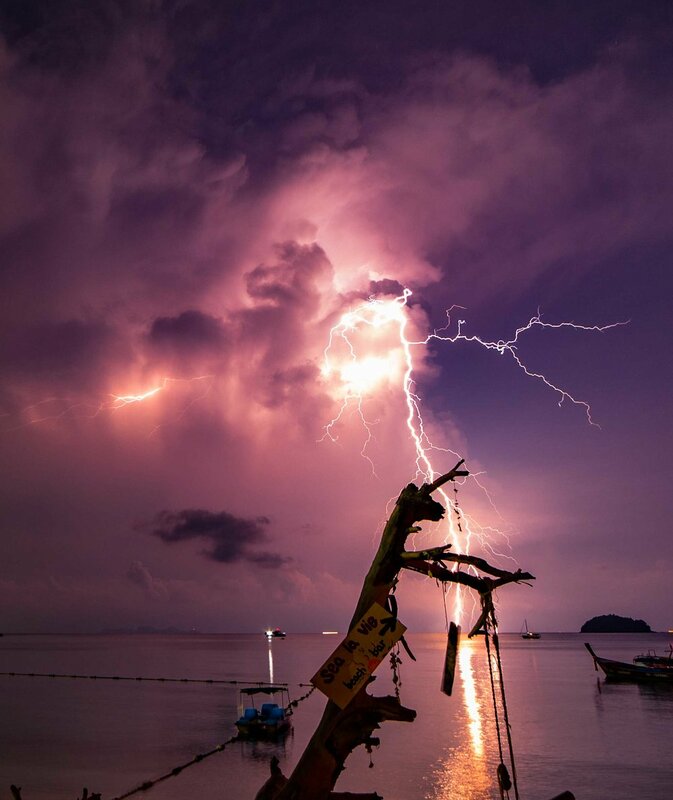 A fierce storm unleashes its power off the island of Koh Lipe, in far Southern Thailand. 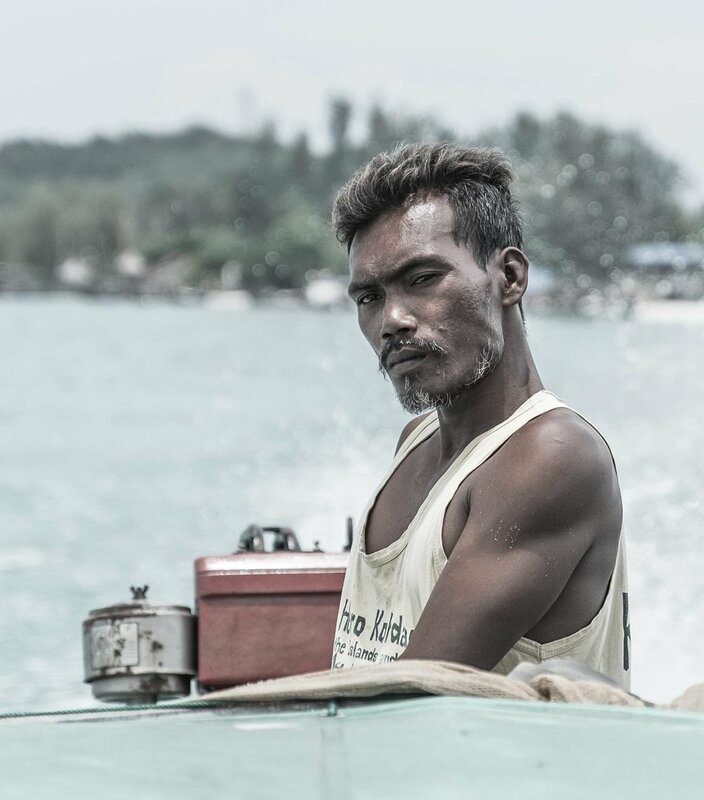 A young shiphand drops anchor off the coast of a tiny island in the Andaman Sea. A wizened captain of a longboat ferry makes his way between the islands of Koh Lipe, and Koh Adang in the Andaman Sea. 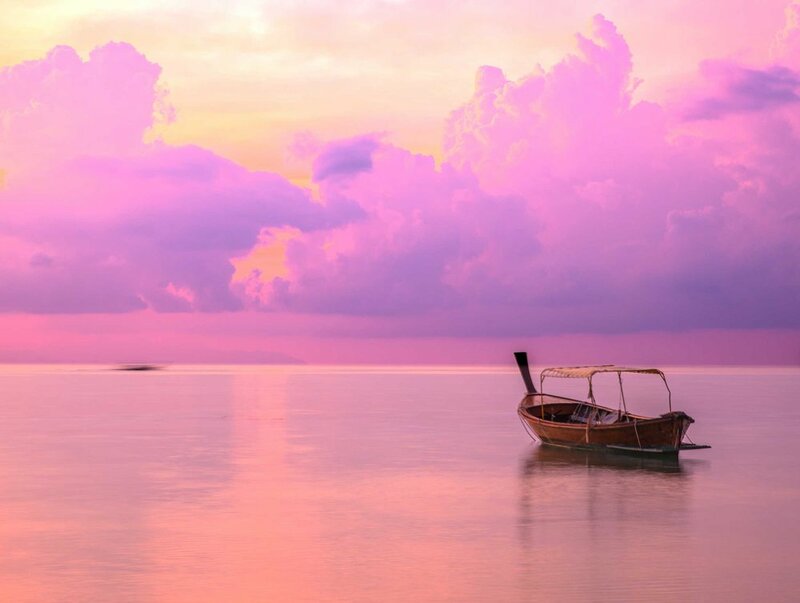 A boat soaks in the first rays of the sun on the island of Koh Lipe. A long exposure reveals the motions of a fire dancing performer. A fish salesman stands sternly in a southern Thailand market stall. 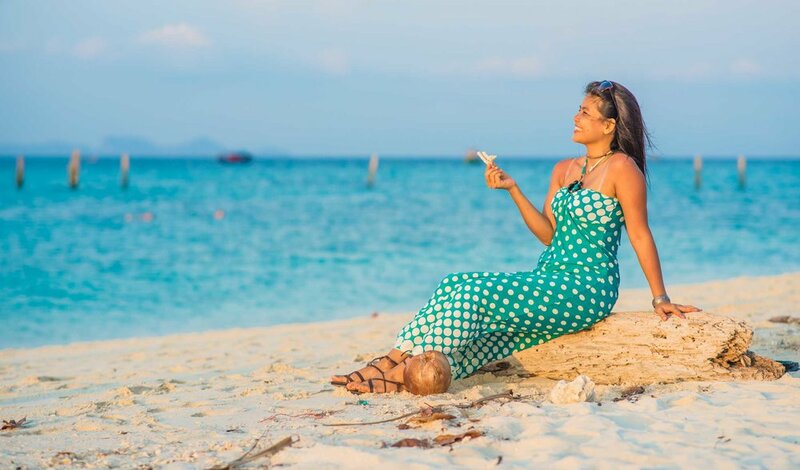 An impromptu fashion shoot on the shores of Koh Lipe in far southern Thailand. 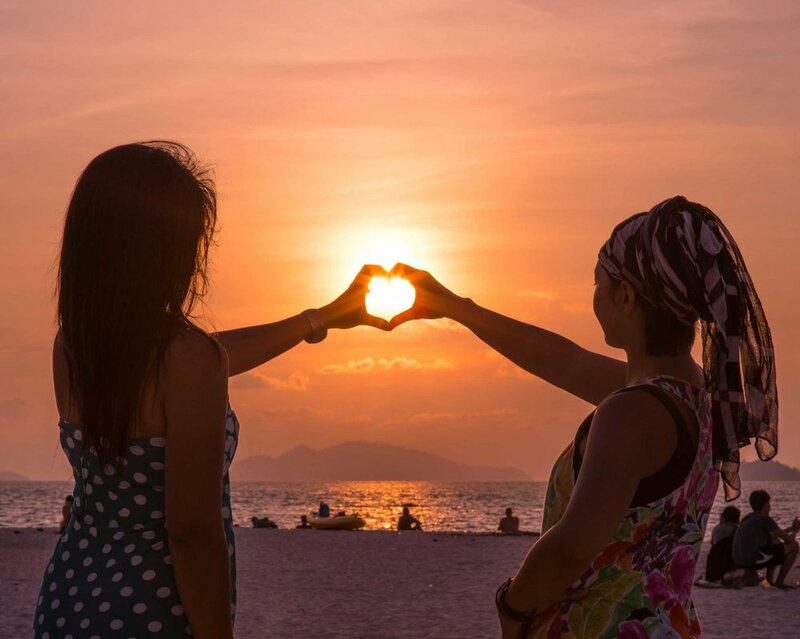 Two friends greet the sun after a long day on the beach. The amphibious form of Koh Tarutao reveals itself in a panorama taken by a drone. The island is the namesake of Tarutao National Marine Park. 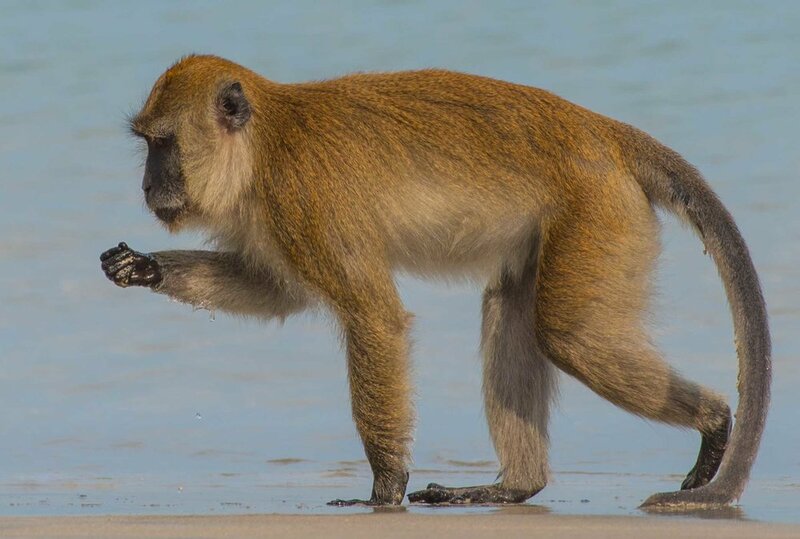 A Rhesus monkey on the beach in Koh Tarutao National Marine Park searches for sand crabs. 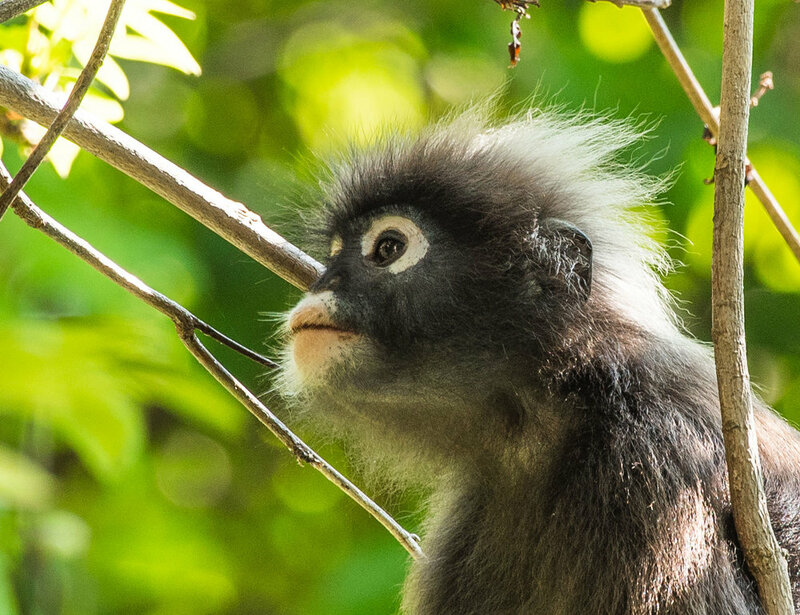 A dusky langur monkey sits high in a tree in the jungle of Koh Tarutao National Marine Park. One of the few surviving buildings of the ageing penal colony on the island of Koh Tarutao. The prison was active until WWII, and today is a collection of ruins being overtaken by dense jungle. 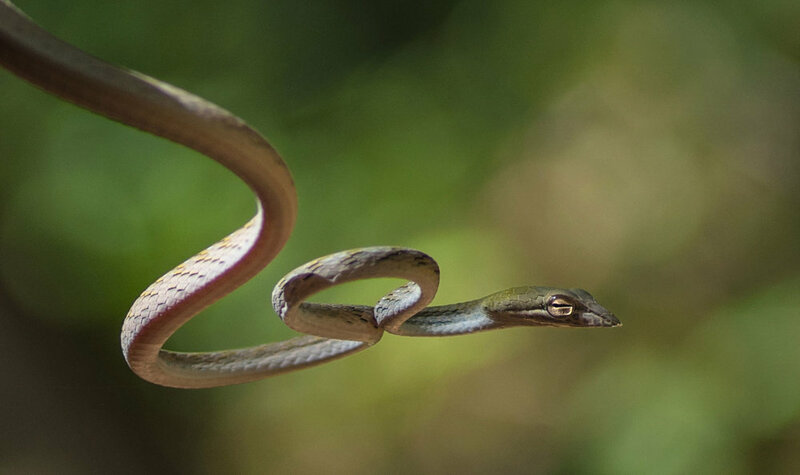 A venomous Green Vine Snake dropped from a tree and landed on a branch a few feet away from the photographer. A small arch, the sole distinguishing feature of a tiny island in the Andaman Sea, rests above brilliant aquamarine waters.